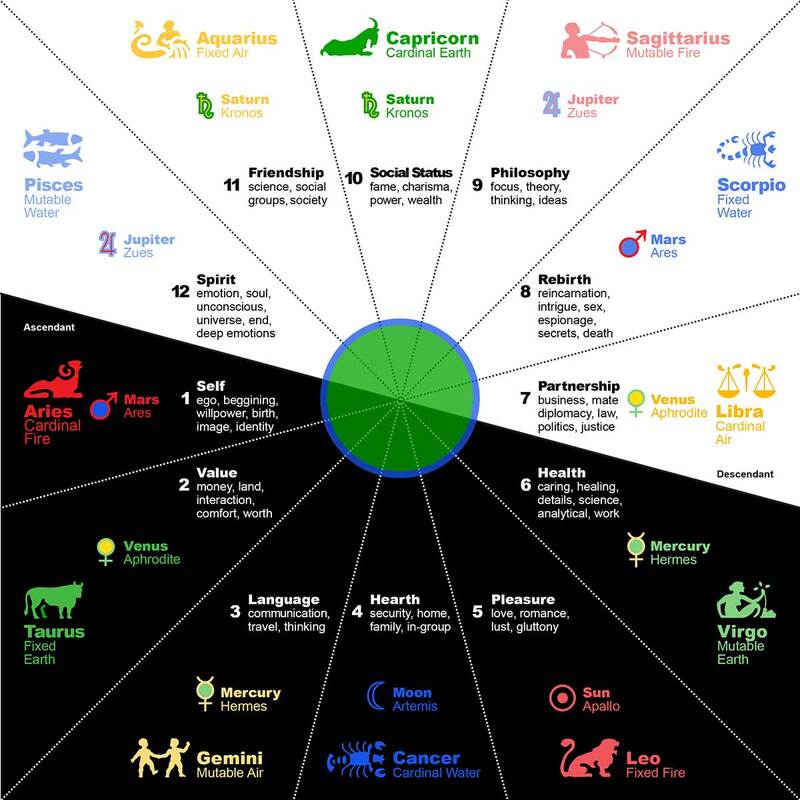 Now, most people have heard of the horoscope and learned about their signs and many of you may be familiar with their meanings and how they relate to one another. The purpose here is to be a learning tool for those who are just getting started on the subject of Astrology, and bring us all up to speed with the basics of esoteric astrology. These will then become building blocks in other esoteric teachings, such as Qabalah and Tarot. As you continue to learn about these subjects, you will find that they correlate in so many different ways and will support you in making a great deal of connections in the mind. This will help you in understanding the world through a series of both complex and simple geometric formula which describe how all of reality is made up. But first let’s cover some Astrology! Each of these levels correspond heavily with each other but are still their own unique system. You are likely very familiar with the four elements so far, and if not – you can watch our Spirit Science video on it right here! For now, we are going to break down the 12 signs of the zodiac and the planetary bodies, in order to show how they relate with one another. If you didn’t know already, Astrology is based on geometry as much as it is based on the celestial bodies. If you were to make a map of the stars we see in the sky, you would find specific groupings or constellations are quite larger than others, and take up more room, making for a rather non geometric grid. However, because of the elliptical orbits of the planets and stars we find that at each moment new geometries are made as these celestial beings move. But the energies we are dealing with not only exist on the physical plane, but they radiate from the higher dimensions and geometric patterns upon which the fabric of our physical universe is based on. To make this simpler to visualize, it is commonly mapped out equally across a 12 tiered wheel. 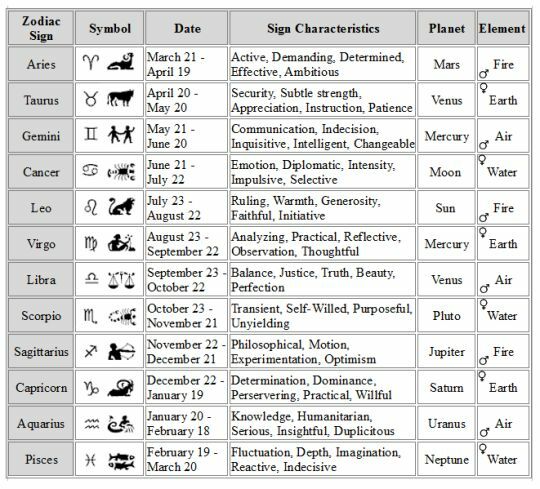 The 12 signs of the zodiac tell a story from beginning to end, and the cycles of life throughout. By its very nature, Aries – the first sign, describes the birth and beginnings of a story or spiritual life, and sense of individual identity. Pisces, at the end – tells of final spiritual revelation, dissolving into death and embarking on the passage of renewal, which then begins again with Aries. The first three signs (Aries, Taurus, and Gemini) represent awareness of self. The second three signs (Cancer, Leo, and Virgo) represent the integration of self with environment. The third three signs (Libra, Scorpio, and Sagittarius) represent the awareness of others. The final three signs (Capricorn, Aquarius, and Pisces) represent the integration of self with the greater society at large. In addition to this story, each of the signs also relate to an element (Physical = Earth, Mental = Air, Emotional = Water, or Spiritual = Fire), as well as one of 3 qualities called “Cardinal” “Fixed” or “Mutable”. Which very simply translates to “Starter” “Maintainer” or “Finisher”, in that order. In a slightly more deeper way of understanding: Cardinal means “hinge” or which something turns, Fixed means “securely fixed in place” or “fastened”, and mutable means “subject to change” which means preparing for the transition into something new. You might also see these three qualities as relative to the Hindu system of “Brahma, Vishnu, and Shiva”; the creative force in the universe, the maintaining of that which is created, and the destruction of creation in order to create again. We are also technically going to be describing the nature of “The Houses” which can be observed more as a sequence than the individual signs themselves. If this is confusing, don’t worry! It will make sense the more you continue to immerse yourself in it. For now, let us keep going; there will be a grid down below which helps put this into perspective too. Next let us briefly explore the 12 signs in a way that will allow you to understand the nature of the flow between them, and how they relate to one another. Aries is the first sign in the zodiac and is all about beginnings. It represents ego, personality, individuality, sense of self, and identity. Passion and emotions are the spark of inspiration and drive to create their lives. This sign also relates to one’s general outlook on life and their physical body. Aries is a fire sign, and so relates with the spiritual will and creative force within a person. Taurus is the second sign in the zodiac and expands that sense of self into things that we can have in our lives, such as money, land, and general sense of comfort and wealth. It’s not entirely external though, as Taurus relates with inner resources too. It also connects with interaction in general between others or the environment. Taurus is an earth sign, and so it speaks towards a more physically grounded “doer” sort of energy. Gemini is the third sign in the zodiac and its element is air; mental. Gemini represents the exploration of ideas and the communication of these thoughts. In this, we find the basis of education as it pertains to learning about the self and close family. It also speaks towards taking short trips, and continuing in learning. Cancer is the fourth sign of the zodiac and now shifts into the second grouping of signs, pertaining more to do with integrating the individual self into the environment. Cancer is a water sign and is emotional by nature, relating with home and family, or just general “being in a group”, as well as a sense of security. This can be indicative of a “foundation” by which you establish yourself, such as the house and home energy describe before. Leo is the fifth sign of the zodiac and now we return to the element of fire, or the spiritual will. Leo is all about love and romance, and the enthusiasm and vitality that is drawn from our passions in life. This sign is thus all about creativity, things that bring you a sense of joy or amusement, and being childlike in nature. Virgo is the sixth sign of the zodiac and has to do with expanding one’s consciousness into a more connected space of caring and healing, and even tapping into the unconscious mind and intuition. Virgo is also very analytical by nature, and has a great focus towards the work and science of life. This sign is further connected with pets and service to others. Libra is the seventh sign and moves into the third group which was “awareness of others”. Libra speaks towards business, diplomacy, law, and justice. Libra is represented by a set of scales, and so you can see how balance in a social sense is fully expressed by this sign. Here we see a huge potential for the relationships we have with others, such as friends and enemies, or just a sense of relationship to others in general. Scorpio is a water sign and being that it relates with the awareness of others in community, speaks towards the emotionally charged undercurrent of humanity. Scorpio is often the sign that digs for the truth in every situation because they are the seer into the mystery of life. Thus we have Scorpio representing physical intimacy, secrets, espionage, and even death and reincarnation. Sagittarius is our last fire sign in the zodiac wheel, and has its mind set on philosophy. Sagittarius is all about ideas, theories, and focusing one’s heart upon something to learn and grow and develop a greater sense of consciousness, including the breakdown of old ideas in order to discover deeper truths. Sagittarius mirrors Gemini on the astrological wheel, and so also speaks to long trips in the search for great truths. Capricorn is the tenth sign and moves into the final of the four groups – integration of the self into the collective. Capricorn is all about social status, and so relates with reputation, such as fame and power. It also relates with the generation of wealth and having lots of charisma, which comes from our profession and status in the world. Aquarius is the eleventh sign and is all about friendship. Here we have a big connection to social groups and society, and being an air sign is very mental, and even speaks to the science of community and social structures. Aquarian are often the odd man out and the big vision thinkers that bring new inventions to the world. Aquarius likes to make goals, hopes and wishes in life, and aiming to resolve circumstances beyond our control. Pisces is the twelfth and final house, and has to do with spirituality. This is the grand finale of the journey through the houses, and speaks towards connecting with the spirit – through the emotions and the deep subconscious layers hidden within us. From this space we draw hidden strength, and deal with our limitations and frustrations in a spiritual manner. Once again, we would like to preface that here we are kind of mixing “houses” and “zodiac signs”, of which fully mirror each other identically but are observed in two distinct ways, and we’ll be looking at that more in depth soon! We would also like to presence that astrology and “horoscopes” are quite a complex subject, as we are energetically connected to not only our sun-sign, but are in fact related to each and every house and each and every planet in some way, shape or form! With this in mind, we are going to cover the planets in another article, because there is just so much information to go over that we’ve found it’s best to keep each section into a manageable chunk for the digestive process to take place! As we bring this chapter to a close, we invite you to take a look at this chart below which helps describe how each zodiac sign relates to each particular element and quality, just to make things a bit easier! Thanks for reading! See you next time in Astrology 102! Somewhat disagree. Leo is not about “love and romance.” That belongs more with Taurus and Libra who are both ruled by Venus. Leo does rule the heart but in this case it represents courage and passion, rather than “love” similar to how Aries’ rulership of the head and brain correlate more to strategy, inclusiveness, and stubbornness as opposed to pure intellect and reason. Also, romantic affairs rather than true love or pure romance are part of the 5th House but so are many other aspects often forgotten by astrologers such as sports and athletics, gambling, risk-taking, and all forms of hobbies. Leo is a lion and so its energy is intense, strong, and fierce. Previous story The Eclipse Meaning, and the Great Cosmic Clock!